Like most 19th century Austrian pianos, the majority of Schweighofers, until the First World War, have the Viennese action, which was the the most popular type in the Austro-Hungarian empire at the time. 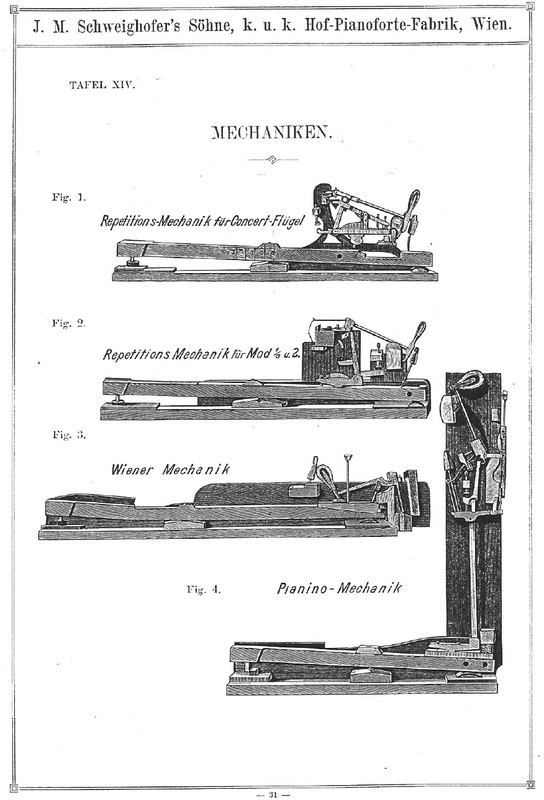 Pianos from the same period with different actions, such as the half-English (or Anglo-German) and double escapement repetition actions, are rare. 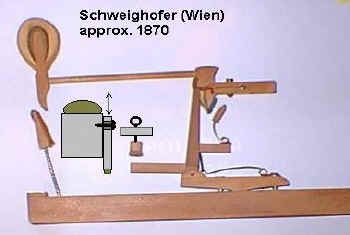 From the 1920's onwards, the Schweighofer pianos had a modern double escapement repetition action. Fig. 4 - upright piano action. The Viennese single-escapement action, like this one from the 1873, Opus 6643 Schweighofer, is a very simple and reliable design. The hammer heads are made of felt covered with a layer of leather. It's main advantages are a sensitive touch, which enables one to play pianissimo without effort, because the hammer only escapes after it has touched the string. The disadvantage, however, is the slow repetition speed and the imprecise strike point because of the way the hammer is mounted directly to the key. The half-English (or Anglo-German) repetition action seen here, from an 1867 Opus 3326 Schweighofer, is a rare variation of the standard English action. 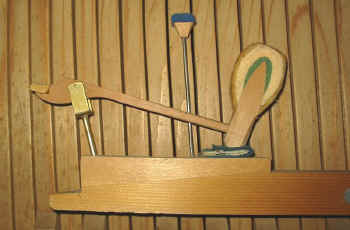 It has an extra feature: the repetition lever connected via a spring to the right of the jack, which allows repetition of the note without completely releasing the key, much like the repetition lever of a modern double escapement (Herz-Erard) repetition action. This action has unusual hammer heads, most being made of several alternating layers of felt and leather. The first treble hammers are made exclusively of leather layers.